Bring a medium pot of salted water to a boil. Add pasta and cook according to package directions. Let pasta cool. Place cooked broccoli, lemon zest and juice, basil leaves, Parmesan cheese, nuts, garlic, salt and black pepper in the bowl of a food processor. Process on low while drizzling olive oil in through the vegetable shoot until desired consistency is reached, scraping the sides of the bowl as needed. Taste and adjust seasoning, if necessary. Place in the refrigerator until ready to use (while pasta cools or if making ahead). 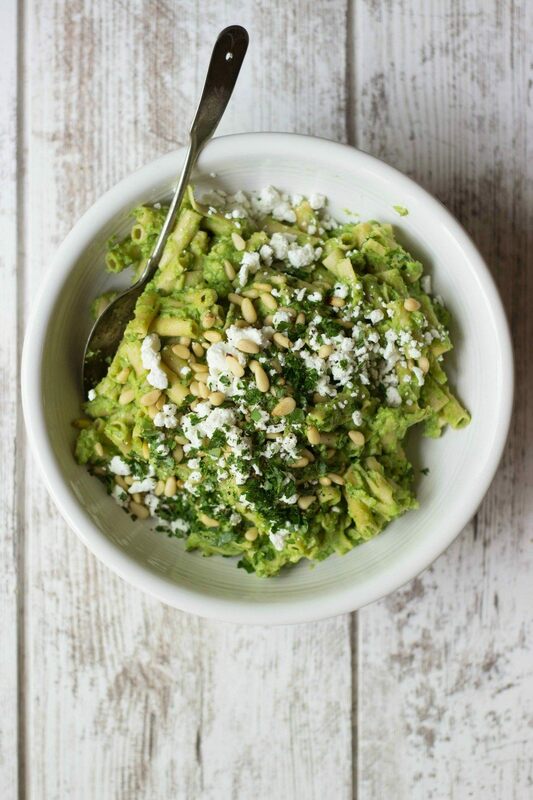 Toss broccoli pesto with cooked pasta until thoroughly combined and transfer to a serving bowl. Top with goat cheese, pine nuts and fresh herbs. Serve.